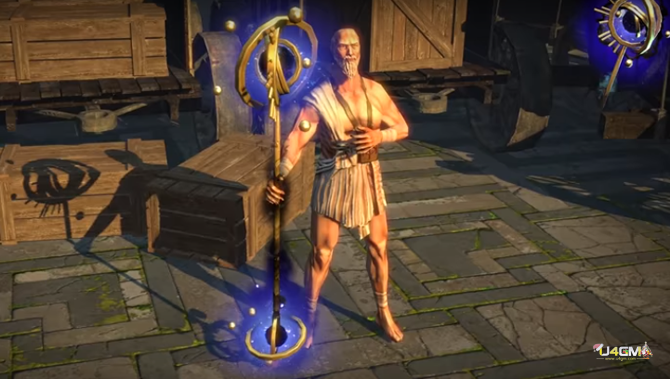 In Path of Exile, GGG have just released the Celestial Staff weapon skin which replaces your character’s staff with a golden metallic skin and swirling celestial effect. If you can’t get enough of the celestial theme, you could always layer the staff with the Celestial Weapon Effect. If you’re using a staff with a Flameblast or Righteous Fire build you can go fully space themed with Celestial Flameblast or Celestial Righteous Fire. 1. Looks awesome! I’m gonna add the Celestial Weapon Effect to it. 2. You know, looking at the Celestial Orb of Storms effect really makes me want a Celestial Lightning Tendrils. How about it GGG? 3. So, for those of us using Flame Totem, any ETA on the Celestial Flame Totem (like Ghost Flame) MTX? 4. This might be the one Celestial Effect I’m not going to get, the spheres on this staff just look way too big in my opinion. If they were smaller I’d reconsider. 5. This piece looks a bit overdesigned. You didn’t need to add that much stuff at the ends. 6. One item one day at a time. Can we get the armour set please? I might upgrade my pack to get my hands on that. 7. MTX over MTX! So disappointing. No skill balance changes and balance at all but ascendancy buffs/reworks. But thats kinda less. 8. Nice animation! Perhaps the celestial portal will look just as nice when you do it, the shaper portal effect is just lacking compared to the new portal effects you have been coming out with. However, it is no doubt that GGG will of course keep working to improve every aspect of the game they can in Path of Exile.